Sidney Crosby and Connor McDavid are two players that use explosive transitions to quickly change direction and keep themselves in the play at all times. If you want to develop quick, smooth transitions then you need frequent practice. In just 20 minutes you can get in a series of drills that will help you work on your mechanics and adapt quickly to what’s happening around you and in no time you’ll notice big changes in your game. 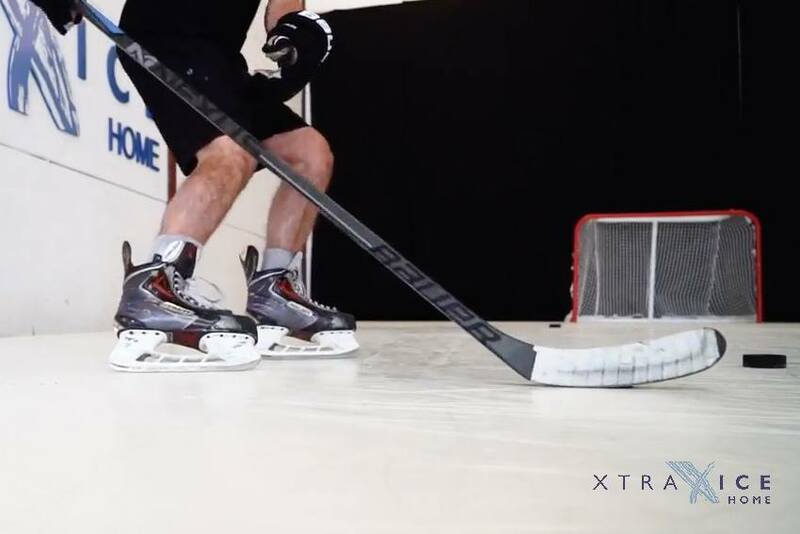 In this series, Trevor Lindros demonstrates a few drills you can do with just two pucks as markers and a small skating area, whether it’s on ice or on Xtraice Home synthetic ice. In this drill you’ll work on using both forward and backward crossovers to generate power out of the stopped position. Do 10 reps and then change sides. If one side is more difficult for you, then be sure to add more reps to that side. Here you’ll use the forward crossover again to generate power out of the stopped position and then instead of stopping at the second puck, you’ll transition from forwards to backwards around the puck, using the transition as a means to accelerate. Once you’ve come to a stop at the first puck again, repeat the pattern in the opposite direction to complete one rep. Here you’ll use the same pattern as in the last drill, though you’ll start out with a backward crossover and continue skating backwards towards the second puck. While rounding the puck, use a powerful backward crossover to accelerate around the puck and then transition from backwards to forwards as you complete the turn. Once you come to a stop back at the first puck, repeat the same pattern in the opposite direction to complete one rep. If you want more intensity, add a stick and puck but be sure to keep your head up and pay attention to your technique. These drills are intended to fine tune your skating mechanics and it’s important not to lose focus on why you’re doing them. Good luck and have fun practicing!